3 comments (last by Drahan). Log in to post a comment. Padan has a new request for you. Corrib River is under attack. Head up north of Tara and take care of those pesky sea and shadow creatures. Word has been passed around of amphibious enemies appearing in the Corrib River. Without our water supply, we cannot provide resources to our wounded allies and citizens in need. This Shadow mission is located at the Tara Stonehenge. Major credits to lycoris for creating this awesome shadow mission! news launcher New launcher released! The MabiPro team would like to announce our new and improved launcher/patcher! We have released Mabi Professional Launcher 2.0. This update to the launcher was intended to remedy several issues with speed and reliability that the old launcher had. We think we've accomplished that goal quite well! Please leave feedback and let us know what you think. In about 12 hours, the old launcher will be disabled from functioning, so you should update as soon as you can. Thanks for the support and please enjoy your time on MabiPro! 5 comments (last by revdb). Log in to post a comment. 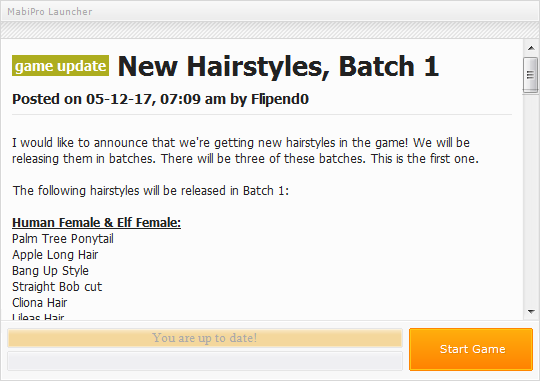 I would like to announce that we're getting new hairstyles in the game! We will be releasing them in batches. There will be three of these batches. This is the first one. Batch 2 will be planned to be released soon, so stay tuned! update new New feature: Party Battles! Ever wanted to battle a group of friends head on in the streets of Dunbarton? Well friends, now you can with Party Battles! The Party Battle feature has been enabled during maintenance Unscheduled Maintenance 5/2/2017. This feature is most known to previous EU players, hopefully it gives you some kind memories! To party battle, create a party and get some friends in it. Next, you'll need an opposing party. The leader of the party should duel request the leader of the opposing party. You will be able to negotiate the terms of the battle (damage percentage, etc). This will allow you to do a traditional PVP match that has multiple configurations of opponents (1v2, 1v3, 8v8, etc). 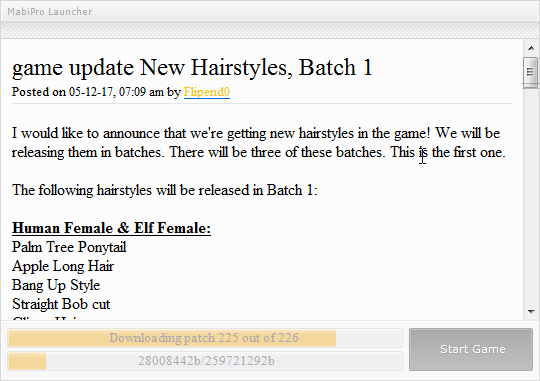 We hope you enjoy this new feature, have fun and enjoy your time on MabiPro!